On Saturday, December 28th at the opening fusionism event Muslim, Christian and Jewish artists collaborated on a large wall panel. It was an amazing experience for all the artists. There are 3 more upcoming exhibitions and lectures in the next two weeks. Stay tuned for more details! 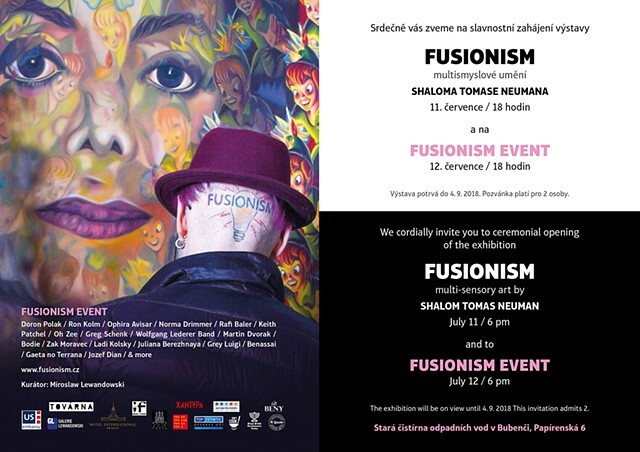 Shalom T. Neuman, Wolfgang Lederer Band, Miloš Vacík & Tam-Tam Batucada"
There will be a FusionArtSteam event, "Temporary Autonomous Zone" on September 23, in Florence, Italy during the awards ceremony. Awards will be presented at the Teatro Odeon in Florence. 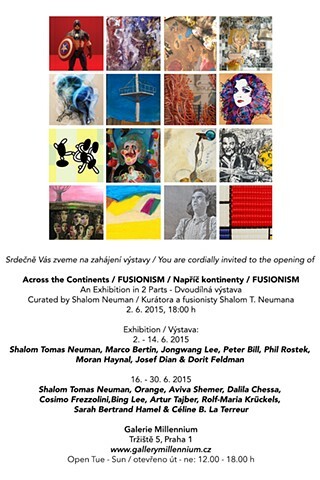 A performance by Shalom T. Neuman will accompany the exhibition 'Francis BACON & Bohumil HRABAL: Two Geniuses' and will be staged on 19 June 2012 at 5 pm at GATE Gallery and Information Centre, Husova 21, Prague 1. Artists approached for the very first exhibition are ones for whom ecology is an important theme: Linda Cihárová, Petra Gupta Valentová, Markéta Hlinovská, Veronika Richterová, Shendra Stucki and Shalom Neuman. The title of Shalom’s Amerika is a nod to Amerika, the early unfinished novel by Franz Kafka. This series of faces, described by international art critic and lecturer Robert Morgan as “... less portraits than archetypes - composites of much of the weirdness that the artist encounters in human beings who has met ...” are created from modeling paste, acrylic paint and found objects. There is the added dimension of sound in this series giving each “Amerikan” a voice of his or her own.